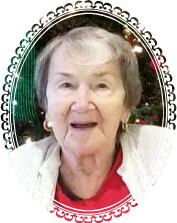 Janet A. Manning, (nee Moravak) passed away peacefully on Wednesday, January 23, 2019 at the age of 91. Born in Brooklyn, NY, Janet eventually moved to Central Florida where she lived for over 30 years. A mother and homemaker, Janet enjoyed traveling with her sister, cooking meals, especially her recipes during the holidays but most of all, spending time with her loving family. Janet is predeceased by her late husband of almost 50 years, Joseph Manning. Also by her late sister, Dorothy and her late brother, Bernard. She is survived by her 5 children, Robert (Dee), Alan (Ann), William (Laura) Manning, Tracy Griesemer and Patricia (Richard) Doyal. Janet leaves behind 13 Grandchildren and 12 Great-grandchildren. The funeral will be at Cherubini McInerney Funeral Home, 1289 Forest Ave. on Tuesday at 10am, followed by a burial at Green-Wood Cemetery. Family and Friends are invited to view on Sunday, 2-4pm & 7-9pm and on Monday from 6-9pm. In Lieu of Flowers, donations would be appreciated to St. Jude’s Children’s Research Hospital, www.stjude.org, which was Janet’s favorite charity. May you rest in eternal peace , you will be missed and fondly remembered all our love Ralph , Barbara ,DeAnna ,Danny and Bobby .